Take a slice of what Americans call "Swiss" cheese, roll it up, pinch off one end, and slide a slimy brown napkin ring over the top. And, I almost forgot, plant the whole thing in a purple egg shell you've partially buried. One last thing: make sure the slime reeks to high heaven. Apparently limited to South and Central America, Staheliomyces cinctus grows from soil that is rich with decomposing plant remains. 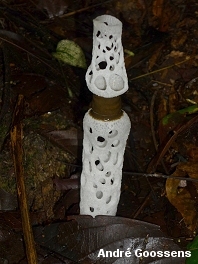 It is an unmistakeable stinkhorn in a genus with only one species. 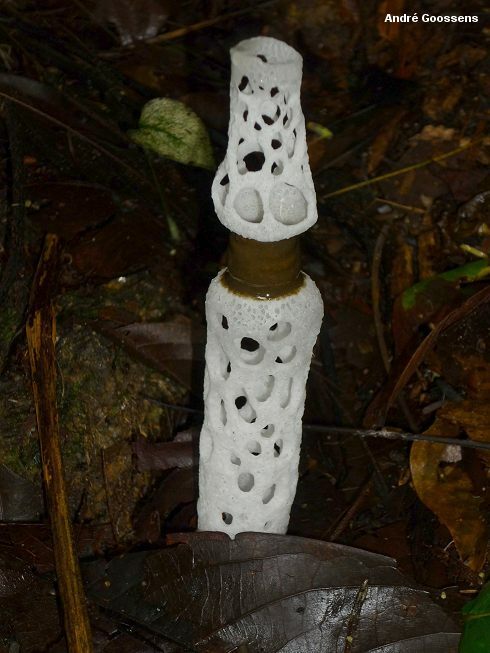 I would call it the awesomest stinkhorn ever--but I have been informed by a prominent mycologist that "awesomest" may not actually be a word . . . so I will simply say that I would love to collect it some day, and I can't think of any awesomer stinkhorns. Ecology: Saprobic; growing terrestrially in soil rich with decomposing plant debris; appearing in rainy seasons; Central America and northern South America. Fruiting Body: At first like a purplish, partially submerged egg attached to conspicuous rhizomorphs; later developing as a hollow, whitish, cylindric structure up to about 12-16 cm high, featuring conspicuous pits and holes; the apex narrowing or with a pinched-off appearance; with a belt-like band, 1-2 cm wide, of olive brown spore slime positioned between the midpoint and the apex. Microscopic Features: I have no data on microscopic features. REFERENCES: Fischer, 1921. (Saccardo, 1925; Zeller, 1948; Saenz & Nassar, 1982; Miller & Miller, 1988; Calonge, Mata & Carranza, 2005.) I have not collected this mushroom.